Pre Trip Inspection- The intention is to help you find problems that could cause a crash or break down. During a trip you should watch gauges for signs of trouble and use your other senses to check for problems. Enroute Inspection- When you stop, check your tires, wheels and rims. You need to check your brake lights and reflectors, brake and electrical connections, trailer coupling devices and cargo securement devices. End of the day or when switching equipment- Inspect your vehicle and fill out a vehicle condition report that lists the problems you find. Safety for yourself and others is the most important reason to inspect. A defect found during an inspection could prevent problems later. Federal and state laws require cdl drivers to inspect their vehicles. What are the most important reasons for doing a vehicle inspection? Safety for yourself and other road users. Correct! All are important reasons to inspect your All are important reasons to inspect your vehicle. 1.Safety for yourself and other road users. 2.A vehicle defect found during an inspection could save you problems later. 3.Federal and state regulations require you to inspect your vehicle. A vehicle defect found during an inspection could save you problems later. Correct! All are important reasons to inspect your All are important reasons to inspect your vehicle. 1.Safety for yourself and other road users. 2.A vehicle defect found during an inspection could save you problems later. Federal and state regulations require you to inspect your vehicle. Question 02. During a trip you should watch ___________ for signs of trouble. Question 03. You should have a minimum of _____ tread depth on steering tires. Incorrect. You should have a minimum of 4/32" tread depth on steering tires and 2/32" on all others. Correct. You should have a minimum of 4/32" tread depth on steering tires and 2/32" on all others. Question 04. You are taking a break in the middle of your trip, you should__________? call and check-in with dispatch. Incorrect. During a trip you should check the following items when you stop: tires, wheels and rims, brakes, lights and reflectors, brake and electrical connections to the trailer, trailer coupling devices and cargo securing devices. check critical items such as: tires, brakes and cargo securing devices. Correct. During a trip you should check the following items when you stop: tires, wheels and rims, brakes, lights and reflectors, brake and electrical connections to the trailer, trailer coupling devices and cargo securing devices. Question 05. Tires of a mismatched size and type should never be used together. Correct. You should check your tires for: 1. proper air pressure 2. bad wear. 3. cuts or other damage. 4. tread separation. 5. dual tires that touch. 6. mismatched sizes 7. radial and bias-ply tires used together. Incorrect. You should check your tires for: 1. proper air pressure 2. bad wear. 3. cuts or other damage. 4. tread separation. 5. dual tires that touch. 6. mismatched sizes 7. radial and bias-ply tires used together. Question 06. Rust around the lug nuts indicates ____________? Correct. Rust around the lug nuts may mean they are loose, check for tightness. It is an old rim and needs to be replaced. Incorrect. Rust around the lug nuts may mean they are loose, check for tightness. Nothing, if you live in the northeast. Have the rim repainted. Question 07. Which critique of a brake shoe is most correct? Brake shoes should not be larger than a quarter on the steering axle. Incorrect. Brake shoes should not be worn dangerously thin, missing or broken. Brake shoes should have the same thickness as a penny. Brake shoes should not be worn dangerously thin. Correct. Brake shoes should not be worn dangerously thin, missing or broken. Question 08. What should be checked in the steering system. Steering system should not contain bent, broken or loose parts. Correct. Steering arms should not have missing nuts, bolts or cotter keys. Other defects to look for on the steering system are bent, loose, or other broken parts such as the steering column, steering gear box or tie rods. Steering arms should not have mismatched, bent or cracked lug nuts. Incorrect. Steering arms should not have missing nuts, bolts or cotter keys. Other defects to look for on the steering system are bent, loose, or other broken parts such as the steering column, steering gear box or tie rods. Up to 1/4 of the steering system parts may be broken. Question 09. Which definition best describes the suspension system? If the cargo is loaded properly you are not at risk of broken suspension parts. Incorrect. The suspension system holds up the vehicle and its load. It keeps the axles in place. Broken suspension parts can be extremely dangerous. The suspension system holds up the vehicle and its load. It keeps the axles in place. Correct. The suspension system holds up the vehicle and its load. It keeps the axles in place. Broken suspension parts can be extremely dangerous. Question 10. If less than 1/4 of the leaf springs are broken or are missing you may still drive the vehicle. Correct. If "more" than 1/4 of the leaf springs are broken or are missing the vehicle will be placed out of service, but any defect could be considered dangerous. Incorrect. If "more" than 1/4 of the leaf springs are broken or are missing the vehicle will be placed out of service, but any defect could be considered dangerous. Question 11. Rims cannot have welding repairs. Correct. Rims cannot have welding repairs. Incorrect. Rims cannot have welding repairs. Question 12. What three pieces of emergency equipment are you required to have in a truck? All are correct. You are required to have a fire extinguisher, three red triangles and spare electrical fuses. p>All are correct. You are required to have a fire extinguisher, three red triangles and spare electrical fuses. Question 13. During a pre-trip inspection what should you check on a truck carrying cargo? Incorrect. You must make sure the truck is not overloaded and the cargo is balanced and secured for each trip. If the cargo contain "hazardous materials", you must inspect for proper papers and placards. A bill of lading for each piece of freight on the vehicle. Not overloaded, properly balanced and secured before each trip. Correct. You must make sure the truck is not overloaded and the cargo is balanced and secured for each trip. If the cargo contain "hazardous materials", you must inspect for proper papers and placards. Question 14. 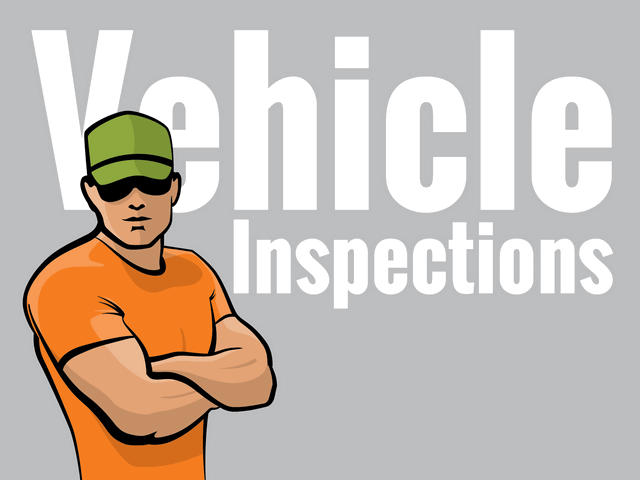 Why should you inspect a vehicle in the same manner each time? To help you pass the pre-trip inspection portion of the basic control skills test. Incorrect. So you will learn all of the steps and be less likely to forget something. So you will learn all of the steps and be less likely to forget something. Correct. So you will learn all of the steps and be less likely to forget something. Question 15. Upon approaching a vehicle, what are some items you should check? Correct. Upon approaching the vehicle check underneath for any leaks (fuel, oil, coolant, power steering fluid). Check the condition of the windshield and wiper blades. Check the condition of the wipers. Question 16. How can you tell if a belt is in proper working condition? Check for any leaks from the belt indicating looseness. Incorrect. Check belts for tightness and excessive wear. Check that the bolts on the belt are not loose. Check for tightness and excessive wear. Correct. Check belts for tightness and excessive wear. Question 17.Drivers of cargo trucks should inspect their load within the first 40 miles of a trip and every 100 miles or two hours afterward. Incorrect. Drivers of cargo trucks should inspect their load within the first "25" miles of a trip and every "150" miles or "three" hours afterward. Correct. Drivers of cargo trucks should inspect their load within the first "25" miles of a trip and every "150" miles or "three" hours afterward. This section contains knowledge and safe driving information that all commercial drivers should know. You must pass the test on this information to get a CDL. Why inspect your vehicle? Safety for yourself and others is the most important reason to inspect. A defect found during an inspection could save you problems later. Also, federal and state laws require that drivers inspect their vehicles. There are three types of vehicle inspection. First is a pre-trip inspection. Its intention is to find problems that could cause a crash or breakdown. During a trip, you should watch gauges for signs of trouble and use your senses to check for problems. Next, when you stop, check tires, wheels and rims, brake, lights and reflectors, brake and electrical connections, trailer coupling devices, and cargo steering devices. At the end of the day or when switching equipment, you should inspect your vehicle. You need to fill out a vehicle condition report, listing any problems you find. Check your tires for proper air pressure, cut or cracked valve stems, mismatched sizes, dual tires that touch, and for minimum tread depth, you should have 4/30 sockets on steering axles and 2/30 sockets on all others. Check for bad wear such as tread separation, cuts or bruises, and make sure radial or bias-ply tires are not used together. Check your wheels for wheel and rim problems. Check for damaged rims and bad wheels. Check for rust around the lug nuts, which may indicate they are loose. Check them for tightness. Check for missing clamps, spacers, or lugs. Check for mismatched, bent, or cracked lock rings and check that wheels or rims do not have welding repairs. You also need to check your brake, drums and linings. Check for cracked drums, shoes or pads of oil, grease, or brake fluid and make sure shoes are not worn dangerously thin, missing, or broken. Your steering system is critical to the safety of your vehicle. You want to check for missing nuts, bolts, cotter keys or other parts from steering arms or linkage. If power steering equipped, check hoses, pumps, and fluid level. Also check for leaks. You also want to check your steering system for bit, loose, or broken parts such as the steering column, steering gear box, or tire rod ends. The suspension system holds up the vehicle and keeps the axles in place. Check for spring hangers that allow movement of the axle from proper position. Also, check for cracked or broken spring hangers. Look for missing or broken leaves. A quarter or more, and the vehicle is out of service. Check for broken leaves that may have shifted and hit a tire. And also check for any loose, cracked, broken or missing frame members. You also want to check your suspension system for leaking shock absorbers which may indicate they are going bad. Check torque rods or arms, u-bolts, spring hangers or other axles' positioning parts that are cracked, damaged or missing. Exhaust system defects can be very dangerous. Check for loose, broken or missing exhaust pipes, mufflers, tail pipes or vertical stacks. Also, look for loose, broken, or missing mounting brackets, clamps, bolts or nuts. Exhaust system parts rubbing against fuel system parts, tires, or other moving parts of the vehicle are very dangerous. Also look for exhaust system parts that are leaking. Commercial vehicles are required to have three pieces of emergency equipment. You are required to have a fire extinguisher, spare electrical fuses, and some kind of warning device for parked vehicles such as three red reflective triangles. Make sure the truck is not overloaded and the cargo is balanced and secured before each trip. If the cargo contains hazardous materials, you must inspect for proper papers and placards. A seven step inspection method is recommended. You should inspect the vehicle the same way each time so you are less likely to forget something. First, an overview of the truck. Next, check the engine then go inside. Check the lights. Do a walk around inspection. Check signal lights. Start the engine and check the brake system. The first step is the vehicle overview. When you are approaching the vehicle, notice the general condition. Check around the vehicle for hazards, people's other vehicles, low hanging wires, or tree limbs. Look for damage on the vehicle leaning from side to side. Look underneath for fresh oil coolant, grease, or fuel leaks. Check the condition of the windshield. Check the wiper blades for damage, good rubber, and that they are secure. Step two is to check the engine department. First, check that the parking brakes are on and the wheels are chocked. Take the keys with you to prevent someone from starting the engine and moving the truck. Next, check the following: engine oil level, coolant level and radiator, and the condition of the hoses. In a pressurized system, never remove the radiator cap to check the coolant level. Next, check power steering fluid level, hose condition, battery fluid level, connections and tie-downs. Check the automatic transmission fluid level, the condition of the belt, check for tightness and excessive wear, leaks in the engine department and make sure there is no cracked worn electrical wiring insulation. My horns and heater and frost are working. Now, I test my parking brakes. I apply the parking brakes, put the vehicle into a low gear and gently pull forward. If the parking brake holds the vehicle back, then it works properly. I check that my safety belt is securely mounted, adjusted, and latches. If the vehicle is equipped with hydraulic instead of air brakes, I want to check the system for leaks. I pump the brake pedal three times. If the brake pedal decreases all the way to the floor, then I have a hydraulic leak. If the vehicle is equipped with a hydraulic brake reserve or backup system, when the key is off, depress the brake pedal and listen for the sound of the reserve system electric motor. Check that the warning buzzer or light is off. If your vehicle is equipped with air brakes and you fail to perform an air brake check, this will result in automatic failure of the vehicle inspection test. Air brake safety devices vary. However, this procedure is designed to see that any safety device operates correctly as air pressure drops from normal to an air condition. For safety purposes in an area where incline is present, you will use wheel chocks during the air brake check. We will use the acronym GSALE to help you remember your final air brake check. The air governor is similar to the thermostat in your furnace. When the temperature in your house gets to 68 degrees, the furnace turns on, when it reaches 72 degrees, the furnace turns off. The air compressor should turn on when the pressure gets down to 100 psi and turn off at 125 psi. In order to check if the governor functions properly, run the engine at a fast idle. The air governor should cut the air pressure between 100 and 125 psi depending on the vehicle. The pressure shown on your air gauge will stop rising. With the engine idling, step on and off the brake to reduce the air tank pressure. The compressor should cut in at about 85 lbs. The pressure should begin to rise if the air governor does not work as described or it may need to be fixed. A governor that does not work properly may not keep enough air pressure for safe driving. Check rate of air pressure build up. When the engine is operating at RPM, the pressure should build from 85 to 100 psi. If air pressure does not build up fast enough, your pressure may drop too low during driving requiring an emergency stop. Do not drive until you get the problem fixed. Next, test air leakage rate with a fully charged air system typically 125 psi and turn off the engine, release the parking brake, and time the air pressure drop. The loss rate should be less than 2 psi in one minute for single vehicles and less than 3 psi in one minute for combination vehicles. Apply leakage rate. Apply 90 psi or more with the brake pedal. After the initial drop, the air pressure falls more than 3 psi in one minute for single vehicles or more than 4 psi for combination vehicles, the air loss rate is too much. Check for air leaks and fix before driving. Otherwise, you may lose your brakes. Next, test the low pressure warning signal. Shut the engine off when you have enough air pressure so that the low pressure warning signal is not on. Turn the electrical power on and step on and off the brake pedal to reduce air tank pressure. The low pressure warning signal must come on before the pressure drops to less than 60 psi in the air tank. If the warning signal doesn't work, you could lose air pressure and you would not know it. This could cause sudden emergency braking dual systems, the stopping distance will be increased, only limited braking can be done before spring brakes can come on. Next, check that spring brakes come on automatically. Chock the wheels and release the parking brake when you have enough pressure to do so and shut the engine off, step on and off the brake pedal to reduce the air tank pressure, the parking brake knob should pop out when the air pressure falls between 45 and 20 psi. This causes the spring brakes or emergency brakes to come on. While you are still in the cab, check the condition of the controls. Check that the steering wheel doesn't have excessive play, the clutch has two inches of free play, check that the accelerator does not stick, check the brake controls. Check the floor brake, the parking brake, the trailer brake, and any engine retarder controls. Check the controls for looseness, sticking, damaged, or improper settings. Check that all external lights and reflective equipment are clean and functional. Lights and reflector checks should include clearance lights, red on the rear, amber elsewhere, headlights, high and low beams, tail lights, turn signals, four way flashers, brake lights, red reflectors on the rear of the vehicle, and amber everywhere else. On your walk around inspection, you want to check the conditions of all the wheels. Check the condition of the tires, the rims, and that lug nuts are present and secure. Check that hub oil level is full if you have a visible sight glass. If not, check that seals are not leaking. You also want to check for any loose, cracked, broken, or missing frame members, any air suspension systems that are damaged and/or leaking. Check torque rod or arm, u-bolts, spring hangers, or other axle positioning parts that are cracked, damaged, or missing. Check for leaking shock absorbers. During your work around inspection, you want to check the brakes on each wheel. Check the condition of the brake drum or disc, check the condition of brake linings or pads, check the condition of all hoses. You want to move to the rear of your vehicle and check that all tail, clearance lights and reflectors are clean, and the proper color, red in the rear. Check that right and left turn signals are the proper color of red, yellow, or amber. Make sure you have license plates, splash guards, tail boards, and end gates are free of damage and are properly secured. Make sure rear doors are securely closed, latched, or locked. Step six is to check the rear signal lights. Turn on the headlights and four-way flashers and go to the rear of the vehicle. Check that four-way flashers are working. Check all parking, clearance, side marker and identification lights, and check your individual right and left turn signals, separate from your four-way flashers. Step seven, start the engine and check the brake system. Test for air leaks on brake equipped vehicles. Test for hydraulic leaks on vehicles without air brakes. Test the parking brakes. Test the service brake for stopping action. If you find anything unsafe during the pre-trip inspection, get it fixed. Federal and state laws forbid operating an unsafe vehicle. Another type of inspection is an in-route inspection. You want to check these items regularly during a trip. Check all your instruments, air pressure gauges, temperature gauges, pressure gauges, amp meter voltmeter. Make sure your mirrors are adjusted. Check tires, cargo and cargo covers. Use your senses. If you see, hear, smell, or feel anything that might mean trouble, stop and check it out. Drivers of trucks transporting cargo must inspect their cargo within the first 25 miles of the trip and every 150 miles or every 3 hours afterward. You may have to make a written report each day on the condition of the vehicles you drove. Report anything affecting safety or possibly leading to mechanical breakdown.